Lorrie is attending a wedding in Chicago next month. She's longtime friend of the bride's mother, two daughters, and their stepfather. "I went to their youngest's wedding last September", she said, "but I hated what I wore. All the other women had those little narrow dresses, the above-the-knee kind–and I wore a calf-length full skirt. I felt dowdy." She topped it with a rather boxy short jacket in one of the colours of the floral skirt. It was a cobbled-together misstep, because she left planning the outfit till practically the day of the flight. I've been there too: dithering, avoiding shopping, finally making do with something. The other women's dresses were pastel or summer-bright sheaths, the afternoon-wedding staple, familiar and popular as the Wedding March. So why was Lorrie in that skirt? She doesn't want to show her legs, which she deems her worst feature, citing varicose veins topped by what she calls "Knish Knees". She also has problem feet and can't wear heels. I thought of several solutions for the upcoming 'resort elegant' afternoon garden wedding and evening reception. A narrow ankle pant with a special dress/tunic or floaty jacket over it gives coverage where she wants it. She could choose a soft jacket that doesn't read I-just-came-from-the-office, in a non-neutral shade. 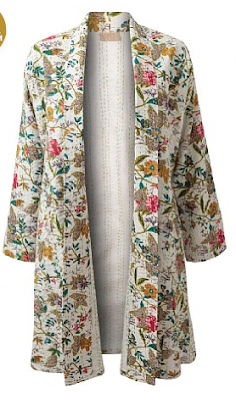 Eileen Fisher's ombré silk jacket and ivory silk pant is a contender, and she'd get a lot of wear from each piece. Shown as a dress, there's no reason this knee-length Marina Rinaldi tunic wouldn't waft over the ivory pants, and the hydrangea is fresh. If Lorrie really wants to wear a skirt, I'd look for an ensemble with a fitted top. The colours aren't perfect for a wedding, but something like Caroline Charles' design avoids a mumsy line. It would also show off her trim waist and defined shoulders. Her dress is a matter of finding the right cut. She could go long, just not too evening-y, to get the coverage she so wants. This silk Samovar print from East UK has it nailed: graceful silk fabric, showing just enough (in this case, arms, a slight scoop back and ceremony-appropriate décolleté) but it's not too formal. (It would also be fine for an informal evening wedding.) Available in sizes 8 to 20. I also showed her J. Peterman's French toile dress, which she'd accessorize with a light wrap and her wide-brimmed white straw hat. She liked it so much she ordered it and says she will keep it even if she chooses something else for the wedding. Weddings are happy affairs, sentimental and significant. For such moments, we need joyful clothes (unless it's like my first one, when my mother wore black and cried nonstop.) But I digress. Lorrie says this time she's finding her graceful piece and kicking up her heels, along with the guests in little dresses. I love all of these, which I think would be more comfortable ultimately than a narrow little dress. With so many weddings more casual these days (at least it seems that way) dressy-not-stuffy is the way to go. I think you nailed this common problem spot on. Just goes to show that a mirror and perhaps a good friend help in choosing an outfit for a big event. Hope your friend enjoys the wedding and her outfit. I really like that J.Peterman dress, I have some of the same issues as your friend has. 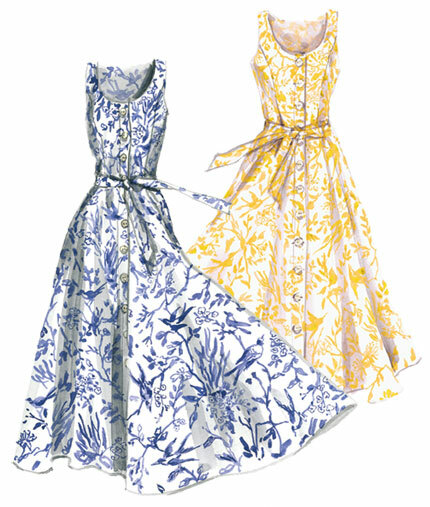 I vote for the French toile dress lovely and so feminine. All of these seem like great ideas for your friend--beautiful choices. I would also add wide-legged silk pants, worn with a fitted, waist-defining top or jacket, to the mix. I have found pants like this to be very useful for Summer occasions, especially when travel is involved. They blend the luxurious feminine swish of a skirt with the comfort and coverage of pants. But the toile dress is lovely, and the long-jacket-over-narrow-pants combo you've shown is a wonderful silhouette. Your friend Huguette's Summer-wedding version in lace is one I will never forget. une femme: I've actually seen •too• casual at a few weddings (at least in a place of workship) but really do love the casual elegant effect. Stacy: As of today she's ordered both the Peterman and the East dresses. She also has a memorial service for her Dad coming up and, as part of the celebratory mood, all the children are determined not to go in somber clothes. Darla: There are a lot of women who for various reasons don't want a short dress! Sitting in them can be a real challenge, you can often see Spanx, and that looks awful. hostess: That's an idea I hadn't thought of, thanks. C. Oh yes, those palazzo pants are wonderful. Lorrie has actually met Huguette. Huguette will spend way, way more- that outfit was by Ventilo. I didn't say •has• more, but she has high-end taste. I agree with your friend, the J. Peterman would get my vote. Now, I'm going to a summer wedding (not my own) and I'm wearing, wait for it, a pastel sheath:). The key to making any of the non-trouser options work without looking frumpy is the shoes. Despite being plus sized, I'm fine with my legs (Thanks, ballroom dancing!) but have very limited tolerance for heels. Any suggestions for comfortable shoe options? DocP: Though Lorrie wears orthotics in walking shoes, she can wear a sandal as long as it has a back strap (not a thong) and sheo wns pairs by Beautifeel, Clarks and Naot- she will pick which pair when she decides on dress. There is no need for any height of heel with these choices; flat-heeled shoes or sandals (that still have an arch for her feet) will be fine. My own choice has long been Arche.